There are few heavy metal bands that have managed to scale the heights that Judas Priest have during their nearly 40 year career. Their presence and influence remains at an all time high as evidenced by 2008’s ‘Nostradamus’ being the highest ¬charting album of their career, a 2010 Grammy Award win for ‘Best Metal Performance’, being a VH1 Rock Honors recipient, and playing to capacity crowds throughout 2011 and 2012 on their Epitaph Tour ¬ they are about to release their 17 th studio album ‘Redeemer of Souls’ through Epic Records. Judas Priest originally formed in the early ’70s in Birmingham, England (an area that many feel birthed heavy metal). Rob Halford, Glenn Tipton, K.K. Downing and Ian Hill would be the nucleus of musicians (along with several different drummers over the years) that would go on to change the face of heavy metal. After a ‘feeling out’ period of a couple of albums, 1974’s ‘Rock Rolla’ and 1976’s ‘Sad Wings of Destiny’ this line¬up truly hit their stride ¬ the result was a quartet of albums that separated Priest from the rest of the hard rock pack ¬ 1977’s ‘Sin After Sin’, 1978’s ‘Stained Class’ and ‘Hell Bent for Leather’ and 1979’s ‘Unleashed In The East’ which spawned such metal anthems as ‘Sinner’, ‘Diamonds and Rust’, ‘Hell Bent for Leather’, and ‘The Green Manalishi (With the Two Pronged Crown)’. Also, Priest were one of the first metal bands to exclusively wear leather and studs – a look that began during this era and would eventually be embraced by metal heads throughout the world. It could be said that Priest simply owned the ’80s as they were second to none as far as pure metal goes, releasing such all-time classic albums as 1980’s ‘British Steel’, 1981’s ‘Point of Entry’, 1982’s ‘Screaming for Vengeance’, and 1984’s ‘Defenders of the Faith’. Once more, these titles spawned countless enduring metal anthems including ‘Breaking the Law’, ‘Living After Midnight’, ‘Heading Out to the Highway’, and ‘You’ve Got Another Thing Coming’. The ’80s were also a decade where Priest became a global arena headliner offering show¬ stopping sets at some of the world’s biggest festivals including the first ¬ever ‘Monsters of Rock’ festival at Donington Park (1980) in the United Kingdom, the US Festival (1983) in the United States and Live Aid (1985) in the United States. The remainder of the ’80s saw Priest embrace more melodic hard rock sounds on 1986’s ‘Turbo’ and 1988’s ‘Ram it Down’ (in addition to their second live set ¬ 1987’s ‘Priest…Live!’) before releasing arguably the heaviest release of their entire career 1990’s ‘Painkiller’ (which saw the arrival of Scott Travis on drums). Judas Priest were special guests on the 2004 Ozzfest appearing alongside Black Sabbath ¬ before issuing ‘Angel of Retribution’ a year later. 2008 saw the release of the double disc concept album, ‘Nostradamus’ which peaked at #11 on the Billboard 200 and a year later ‘A Touch of Evil: Live’ was issued (which led to the group’s aforementioned Grammy Award win due to a killer rendition of the classic ‘Dissident Aggressor’). In 2009 Priest began a celebration of the 30 year anniversary of the release of their classic ‘British Steel’ album, which included a tour that saw the group perform the album in its entirety, and was followed up by an expanded double disc version of ‘British Steel’ in 2010 plus a DVD of their live show. By 2011, Downing announced that he was exiting the band ¬ with a still¬ burning desire to continue flying the flag of metal Judas Priest decided to continue on, by enlisting newcomer Richie Faulkner on guitar. The move seemed to have reinvigorated the band as evidenced by a show ¬stealing performance on the ‘American Idol’ TV program that also served as Faulkner’s debut performance with the band (also in 2011, as was the release of a new compilation ‘The Chosen Few’ which included Priest classics selected by some of metal’s biggest names) and the ‘Epitaph’ concert DVD in 2013. 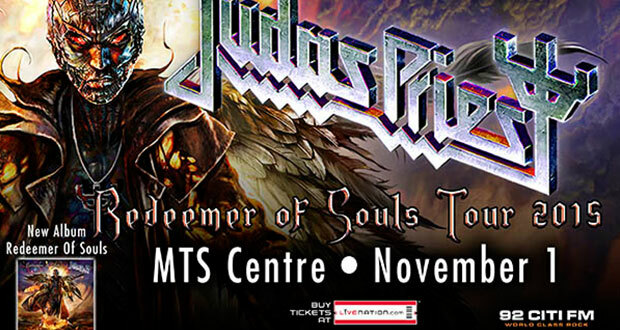 And now, fans will be able to experience Priest’s latest metallic studio classic ¬ REDEEMER OF SOULS! !